In the beginning of my diagnosis, I had only one pill to take; easy enough to hop out of bed and pop it with my daily breakfast. Eventually, one medication wasn’t enough to battle the invasive symptoms of the old lady, and I had to add more; I advanced from one pill a day to six pills, sometimes eight, all taken at different times with and without food. It started getting a bit confusing and I found it tricky to remember to take them, especially on busy days when arthritis was not my main focus. 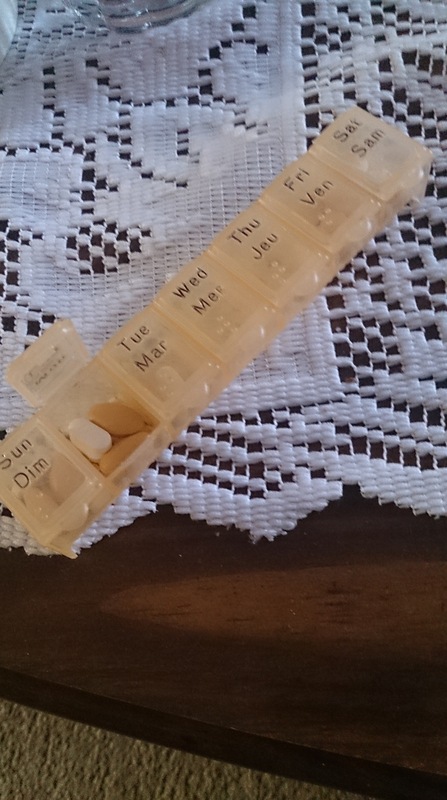 I purchased a compartmented pill-box to help me keep track– but I soon realized the pill-box wasn’t enough – there were still days I would forget to take certain medications. I needed a new plan. I discovered by trying to stick to a regular pattern throughout the day helped me remember to take my medication. I try to get up at the same time each day (depending on the old lady’s temperament). I take my first set of pills with my morning coffee or tea, settle at my desk and check emails; I have breakfast, do a bit writing and take another one; I take subsequent pills over lunch and dinner, attempting to follow the same strategy, associating certain activities with each stage of medication. Staying on a regular routine helps trigger my memory so I remember to eat those meals and take those pills. However, it’s not foolproof – often life throws you a curve ball and takes you away from a regular schedule – and then, things get a little bumpy. I can always tell when my life has taken a detour from its regular path because there are extra pills in my box, and the presence of those pills are a calling card, pulling the old lady from her dormancy. Wandering too far off my routine will sometimes come back and bite me in the-you-know-what; but I do my best. My routine will change, that’s just the way of life, but I try to maintain certain activities for the sake of my foggy memory, my swollen joints and my overstuffed pill-box. It’s crazy when pills have to be taken with or without food, at different times during the day, life gets busy and some days the last thing I’m thinking about is taking my medication. It’s been over a year for me and I still have days I’ve fallen off the wagon 🙂 I think we all need to find our own way to help trigger our memory. Stay well, hope that dragon of yours isn’t wreaking too much havoc. I devised a form to keep track of pending patient meds and procedures. Soon many of the nurses wanted a copy so they could use it too. I stayed organized in a busy ICU, but now I forget my own meds sometimes. I think I need a med nurse!